Is the Economy Already in Another Recession? Last week, the establishment press largely shrugged off the awful and ominous news that the economy shrank at an annual rate of 2.9 percent during this year's first quarter. When they deigned to notice it, they usually told their readers, listeners and viewers that happy days have now returned. 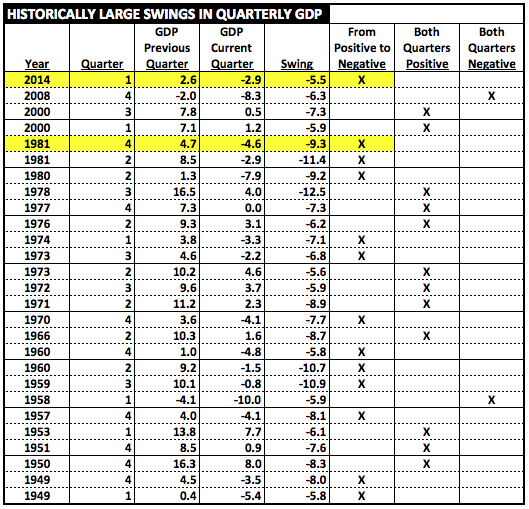 The 5.5-point downward swing from the fourth quarter's 2.6 percent annualized growth to the first quarter's 2.9 percent contraction was the largest such move from expansion to decline since the fourth quarter of 1981. Since the government's Bureau of Economic Analysis began tracking quarterly gross domestic product in 1947, U.S. GDP "has never fallen by more than 1.5 percentage points except during or just before an officially-defined recession." Bloomberg's Richard Yamarone, who is warning that a second-quarter contraction is probable, notes that there has never been a time when year-over-year quarterly current-dollar gross domestic income has been at its just-reported pace of just 2.6 percent without the economy ultimately going into recession. The press would be making these historical points, and many more, following a steep quarterly dive in a Republican or conservative presidential administration, and would be knocking down the office doors of contrarians like Yamarone to get interviews. We know this because they did such things even during quarters of reported growth during the Bush 43 administration, which put up 25 consecutive quarters of expansion through the fourth quarter of 2007 before the POR (Pelosi-Obama Reid) economy ultimately sent the nation into a recession as normally defined in the third quarter of 2008. Instead, they have either pretended that the first-quarter contraction didn't happen, made phony excuses, or put forth assertions which would have embarrassed Izvestia during the worst days of the old Soviet Union. The evening of the report's release, CBS was the only one of the three broadcast networks with early evening news shows which even acknowledged the existence of the GDP decline. At CNN, Christine Romans went on and on about the "terrible weather, terrible weather ... remember how horrible that winter was?" for 30 seconds before telling viewers that "all the economists ... think it bounced back in the second quarter," and that "some economists (predict) even up to 4 percent for economic growth in the second quarter." Her bottom line: "Don't freak out." The weather excuse is beyond pathetic. If it was the reason for April's original disappointing estimate of 0.1 percent growth, something else has to explain why the second estimate went to a 1.0 percent contraction. It's a complete insult to news consumers that these clowns are pretending that the weather had any relevance whatsoever to June's disastrous final number. As I have noted several times elsewhere, all but one of the economy's other winter contractions in the past 50 years occurred partially or entirely during officially declared recessions. The sole exception was 2011's first quarter, during President Barack Obama's reign. Besides, this past winter, as "the 34th coldest such period for the contiguous 48 states as a whole since modern records began in 1895," didn't even make the top quartile of cold snaps. Following the theme set by Romans, CNNMoney.com's Annalyn Kurtz put up a post titled "3 reasons not to freak out about -2.9% GDP." She took the propaganda line a step further when she wrote: "This recovery is underway, but it's still very slow." Setting aside such a foolish reaction to news of a contraction — the strongest contention one could conceivably make is that "growth has returned" — it's also an inadvertent admission that the policies of the now-perceived worst president since World War II have failed to get the economy past the "recovery underway" stage for nearly five years.